Indigo Indian Asian Restaurant in Port Denarau celebrated another year of suc­cess on Saturday night. The restaurant celebrated its 11-year anni­versary. 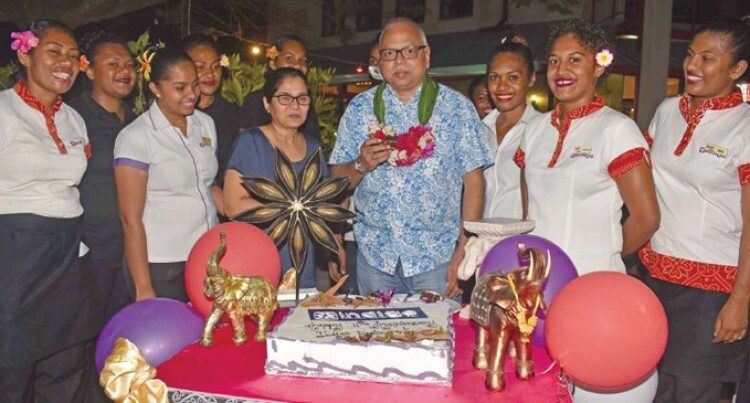 Punja and Sons Limited group market­ing manager Gopal Jadhav officiated at the Jack’s of Fiji-owned restaurant and bar. Mr Jadhav said: “The recipe for their growth would be that they have been serving quality food all the time. “Tasty and quality food that is more impor­tant. “Apart from taste and they take care of the ingredients where they buy from and also the hygiene. Mr Jadhav has been a regular customer since the restaurant’s opening. “I have been coming here since the restau­rant started 11 years ago. I am a great fan of Indian food it’s not that I am an Indian, but I love the food compared to other cuisines,” he added. Supervisor Ritesh Singh, of Sigatoka Val­ley Road, is one of the longest-serving staff members. He joined Corner Café and Saffron (also under Jack’s) in December 2009 and joined Indigo, as it is widely known, in 2012. “The environment, the people we work with and how they take care of our welfare is the motivation behind it,” he added. Indigo has 30 staff members. “There is a lot of opportunities here as there are catering for events and various oth­er training such as for Barista, and chefs to be part of the Salon Culinaire, not forgetting the ones organised by the company itself,” Mr Singh said.